Surrounded by snow-capped peaks of the Caucasuhotel s, where the river Mzymta washes its clear waters the village of Esto-Sadok is located the euro-class Alpine Fairy Tale (Alpyiskaya Skazka), which combine comfort, warmth and a homely atmosphere. 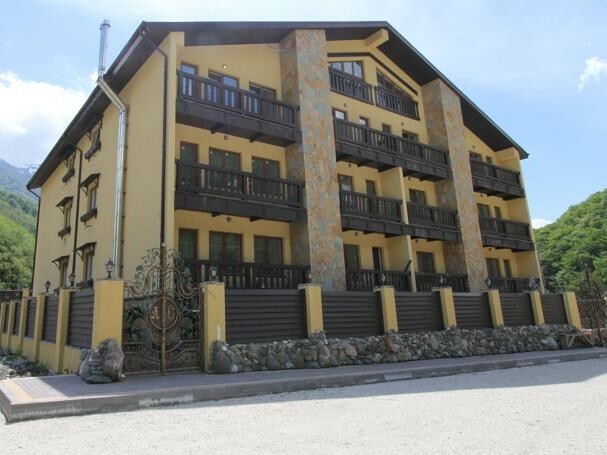 Guests appreciate the hotel's convenient location, as just 2.8 km from the ski lift Laura. Hotel consists of 38 bright and spacious rooms, including standard and deluxe. Each of the rooms is decorated in a classic style and has everything for a good rest - modern equipment and comfortable furniture. Parking is available for guests’ car. Highly qualified personnel will have the maximum assistance in all matters at any time. Taste the delicious dishes of national and Caucasian cuisine can into the restaurant, which is located on the hotel's Alpine fairy tale (Alpyiskaya Skazka. High level of service, hospitality and pleasant atmosphere, friendly attitude of the staff and the great location lure guests Alpine fairy tale return to rest here is not the first time.